Why is my explanation gone? Comply or explain allows owners of services to publicly explain why a certain rating should be different / ignored or invalidated. This allows them to handle edge cases which impede them from ever becoming compliant to common basic security practices. An explanation can be given for each scan that is done on an organization. Each explanation allows to enter some reasoning and has an expiration date. An explanation will thus expire after some time and should be set to a reasonable amount of time. (typically a year). All explanations are published on the website and can also be downloaded for analysis. A scanner gave a wrong rating, or the rating can be explained without compromising security. A scanner could not connect to the scanned service because of incorrect implementation in Web Security Map. A scanner was not behaving according to modern security practices or RFC’s. The result contains a glitch, for example: two conflicting results are shown instead of one. An explanation can applied to any issue, even high risk issues. Explaining something does not make the finding go away. Instead the finding is shown accompanied by the explanation. This is done because a third-party scan will still see the service as insecure: the third party can now correlate their can result with your explanation. Here is an example of a high-risk issue that has been explained. Note that the high-risk has a strike through but is still present. Invalid explanation 1: This is a public service, thus the data does not need to be encrypted. This is invalid because the organization should not determine the privacy of the client. The client will determine if they want to shield their data-transfer from third parties or not. Additionally encryption also results in data integrity which is also important when serving public information. Invalid explanation 2: We don’t offer this kind of security as a matter of policy. Not implementing the most basic security norms because of a differing policy is possible. But the policy has to be explained publicly and has to align with the norms set by the known compliance drivers. Usually a vague explanation like this will be met with scrutiny: why is your policy more important than common security practices? What makes you decide security in this case is not as relevant? Every volunteer handling explanations agrees to be excellent: helpful, professional and honest. Below screenshot shows an organization explaining a high risk issue: their domain runs SIP (phone services) on ports 80 and 443. The vendor of these services has explained they will only use these ports for telephone data between their clients using their own (public and trusted) certificate. The certificate used by the third party is technically correct, but does not use the name of the municipality. Therefore there is no explicit trust. The clients however do check the certificate and there is no website configured at this address. Usually ports 80 and 443 are used for the HTTP protocol: websites and webservices. In this case these ports are used because they are easier to configure on the firewall. Our scanner sees that the incorrectly named certificate is used on a standard website port. Therefore it marks the website as not trusted. Yet because the url is only used by phones, and there is no website configured, the organization actually trusts this certificate setup. The finding has been explained. It’s possible to become a volunteer, which can help enter “comply or explain” requests. You will be granted access to the private issue feed where you can view explain-requests. You’ll also be able to manipulate explain information for scans. This gives a unique position to help your and other organizations to handle edge cases. 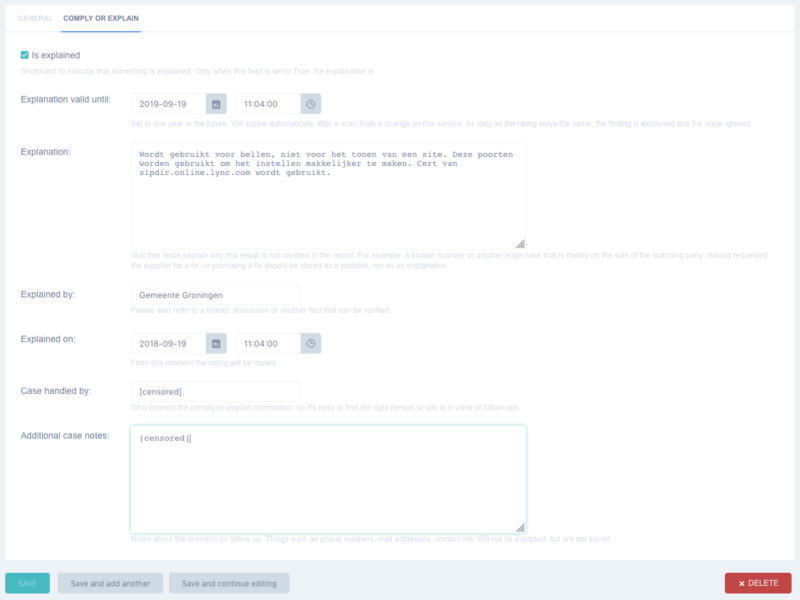 Access to the admin interface using a personal client-certificate. A personal account on the admin interface. Access to the scans in Web Security Map, with the possibility to alter explanations. When handling explain-requests, or any issue in Web Security Map, you’re working with partially confidential information. For example: who is doing the explanation is secret because of privacy reasons (but not the organization explaining it). When handling explain request we expect a professional attitude which is constructive. 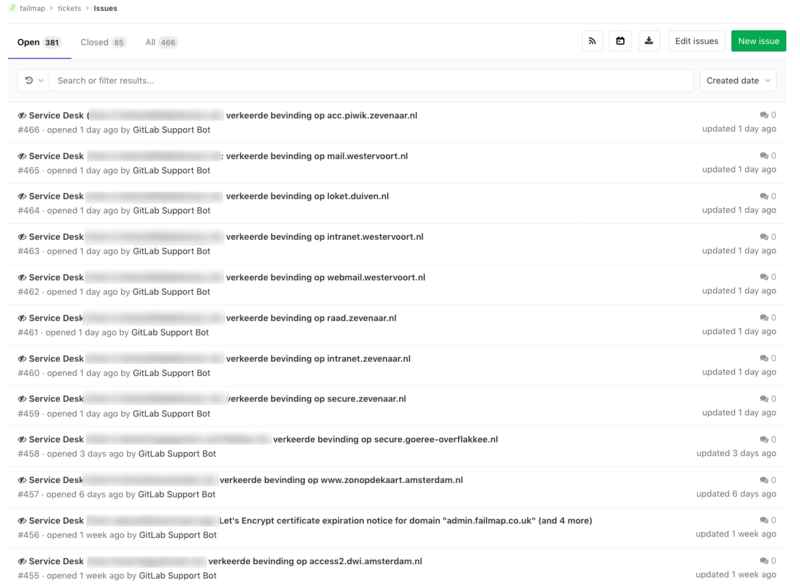 We don’t have a helpdesk system set up yet, and instead are using a gitlab repository to receive issues. To reach the admin interface, you need to use a client-side certificate. This certificate will be handed out when you sign up as a volunteer. Once installed it’s possible to visit the Web Security Map admin interface. Here you’ll be greeted with a login screen. 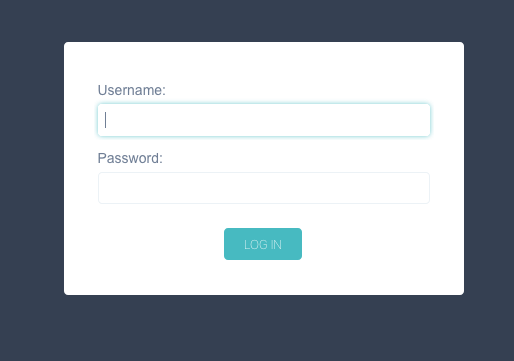 Enter the username and password you’ve received after signing up. After succesfully logging in, you’re looking at the admin interface. 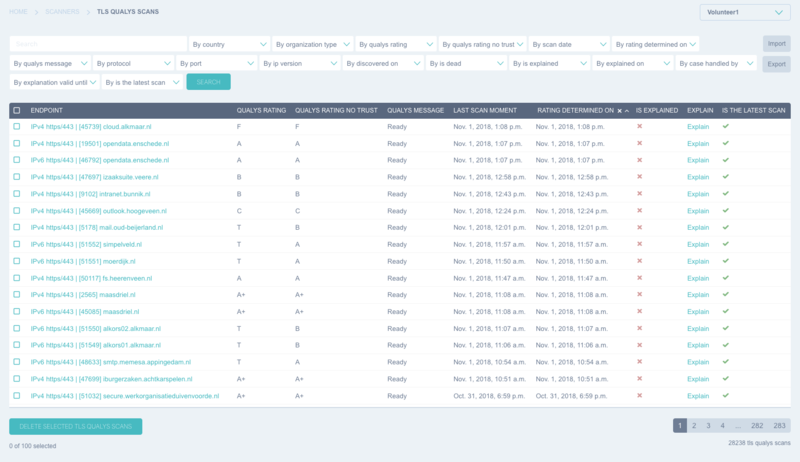 The interface shows a number of columns that show the latest changes, static links and the contents of scanners. On the menu on the side you’ll also see a link to scanners. There are three types of scans in the admin interface. These are detailed in the next chapter. These are actually a variety of different scans stored in the same database structure. The scans saved here are: HTTP header scans, ftp and plain_https scans. Scans on the HTTPS quality, performed by Qualys. This list is empty, and is reserved for future use. Just like Endpoint Generic scans, these are multiple scans stored in the same structure. Currently these are only DNSSEC scans. There is a surprising amount of filters and search options for each scan. It should be pretty easy to find the scan you’re looking for. As you can see in the image below, you can filter on: country, organization type, qualys rating, date, message, protocol, port, ip version, when it was discovered, if the url is still alive, if there already is an explanation, who gave the explanation and so on. Scans are saved over time: this means you can also see scans from last year. To know that you’re working in the latest scan, check the “is the latest scan” value. This will show up in the most accurate reports and the map. Otherwise you’ll editing results of the past, which are only visible in reports of the past. Clicking the “explain” link, or editing the scan, you’ll be presented with the below screen. This allows you to enter information. Please fill in all the fields, including since when the explanation is valid and the expiry date. Expiry is usally a single year. Note the descriptions for each field below the field for further detailed instructions. Afterwards click save, and you’re done. Repeat the process for any scan you want to alter. Every night new reports and map data is calculated. This means your explanations will be processed later in the night and will be visible for the rest of the world tomorrow. Explanations will be tied to a specific scan. When the scan result changes, you need to explain again. So if the result changes, better make sure that no explanation is needed anymore. We usually see this happen with TLS scans, as the security of TLS slowly degrades over time.